Let me ask you a question…Do you ever try to find “normal?” Do you ever think you have reached “normal” status in life? I dont ever think I have thought about it on purpose, yet always there is a sense of whether my life is really normal or not. I didn’t really THINK on purpose about it until 2 months ago. We moved..one of the BIG events you experience in life and after about 2-3 weeks people kept asking me if I was back to” normal.” At first I shrugged it off, but the question kept coming from different people, so I started thinking and I was so upset because…NO THINGS ARE NOT” NORMAL!”Then I started to get anxiety the more I thought..I mean what happens if my life doesn’t EVER go back to previous normal?? I have to create a new one and what is it suppose to be like? I mean, I was getting stressed over this! Has that ever happened to you? Big life changes? A move, a bad health report of you or a close family member, someone passed away that was close to you, loss of a job you had for a long time, empty nest, a new mommy,?? How do you handle it? It can be scary, it can be lonely and leave you with a feeling, like you “just cant.” Leaving a old “normal” for a new one. Whether its by choice, or circumstance not in your control. I have noticed though, through the years of studying the Bible that it never talks about “normal.” In reality following God, is anything but normal to the worlds standards. When we follow God He takes us on paths that seem anything from the norm to what other people think, and He has higher expectations/plans of us that are not in the norm. It does talk about seasons in life….aka chapters of your life. (Ecclesiates 3:3) We all have them and some are better than others,but we have to learn to enjoy and be present in each chapter of life. Each chapter requires us to create a new “normal.”What was normal 2 years ago is so not normal for me now, and I dont have to be scared of that..God is walking with me in this new season. Can I encourage you to embrace this chapter in your life? Define what normal is for you now, own it,and find the joy in it..even if its hard to find. Make the best of this season so you dont have regrets. This Vegan Banana bread, I made for a friend, who is embracing a new chapter in her life, A NEW “normal” With many health issues, going Vegan was the best option for her. And we all know how changing eating habits is defiantly not easy! She is creating her new normal of eating! 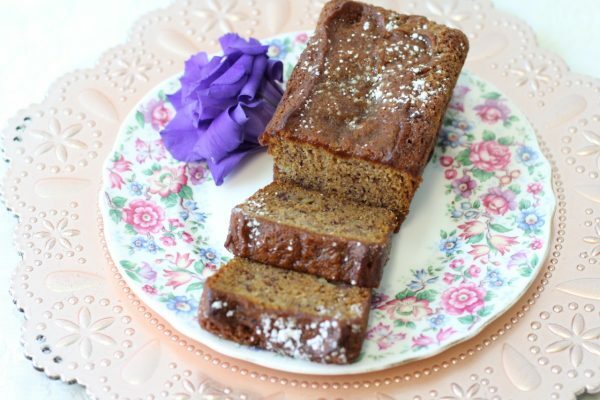 I love this recipe because it is so moist and yummy and NO ONE cares its vegan or will know! 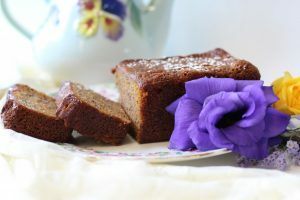 I think we all have to have some back up recipes to have on hand for friends and family that you like to accommodate their diet…it makes them feel loved when you can make something for them that they can eat. Whether its by choice or a necessity. Preheat oven 375. Spray 2 loaf pans with pan spray. Make sure its evenly coated, so the bread wont stick Whisk all the dry ingredients together. In separate bowl, whisk sugar, bananas, oil, water, applesauce. Combine wet with the dry, making sure its well combined. Divide between pans and bake until a toothpick comes out clean, Depending on your oven it may take more than 50 minutes.